Baby shower menu ideas, salads, soups, punch, dessert, and 65 of the greatest party recipes. Create a baby shower menu with style by planning it around your party them. For example, Kabobs and other grilled master pieces are a great compliment to a Luau theme. However, they might not go so well with a Tea Party theme. TIP: Use lettuce leaves and other leafy greens as attractive garnishments to your food platters. -In a large mixing bowl, combine pineapple, grapefruit, strawberries and mango; set ingredients to the side. -In a small saucepan, combine orange juice, lime juice and cilantro. Bring to a boil, reduce heat and simmer for 5-7 minutes. -Strain boiled juice into a small bowl. Discard whole cilantro pieces. Mix in honey (honey should be room temp). Pour over prepared fruit and gently toss until evenly coated. Chill for 2 hours and serve. 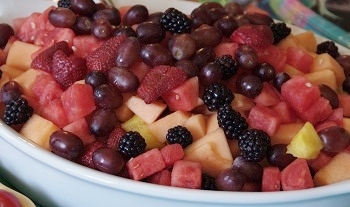 TIP: You can make this salad the night before the party by preparing the fruit and dressing. Store all items in a separate containers(Ziplock Fresh Produce bags are great for keeping things fresh). Mix and toss the following day. -Set cut fruit to the side. -In a large mixing bowl, pour in pistachio mix. Add fresh pineapple, and mix well. -Mix in whipped topping. Fold in bananas, mini-marshmallows, sliced strawberries, and mandarin oranges. Sprinkle in walnuts. Chill for at least 4 hours and serve. TIP: Slice and add bananas, as close to serving time, as possible. Yum! 65 incredible recipes from Martha Stewart Living: Shrimp dip and a mushroom tart…they are so good!